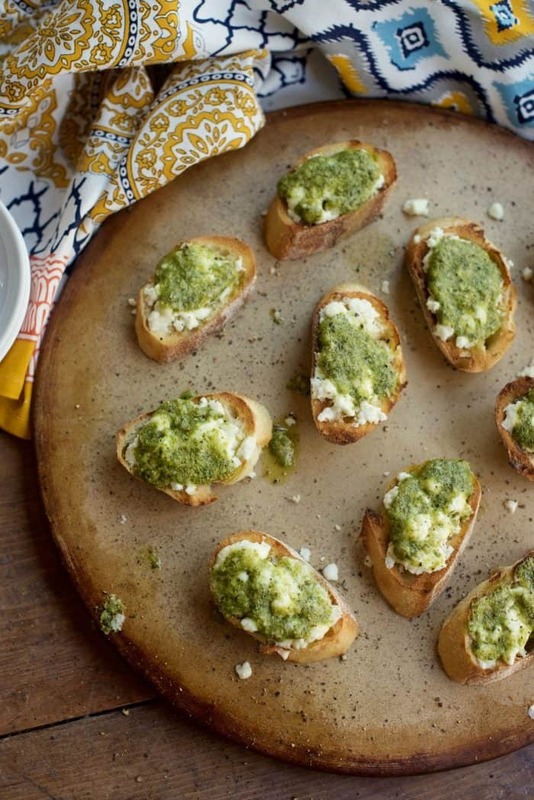 For a last-minute gathering, your guests will love this Pesto Tartine Appetizer Recipe! 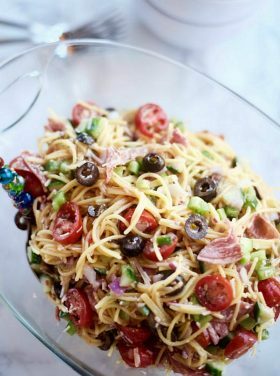 Bring to a party, potluck, or enjoy with a nice glass of wine. Fresh and tasty! This post has been updated with new text and photography! Friends, HAPPY FRIDAY! I wrote this post 5 years ago, so I’m adding new text and photography, and one of my favorite quotes! Which means, find some positive people to hang out with this weekend, and make your words count. Think big, listen big, and be BIG people. Talk about things that will make our world a better place. (And God forbid, don’t be a small person and gossip about other people). 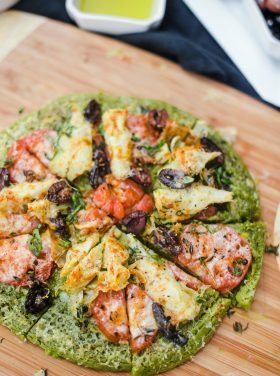 If you are a basil lover (I love the smell), and love “easy,” then this Pesto Tartine Appetizer Recipe is for you! One thing I miss about being “back home” in Medford is our garden, which at one time we had 12 beds. Our herb trough always had basil, rosemary, thyme, oregano, and chives. Oh, and occasional dill. 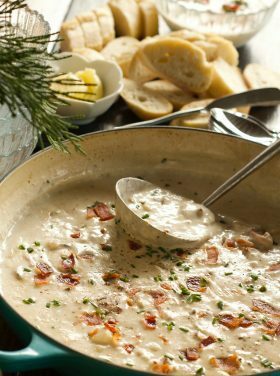 This recipe is perfect for last-minute get togethers or a quick bite with a hot bowl of soup. Tonight we have friends in town from Portland, so our house will be full. 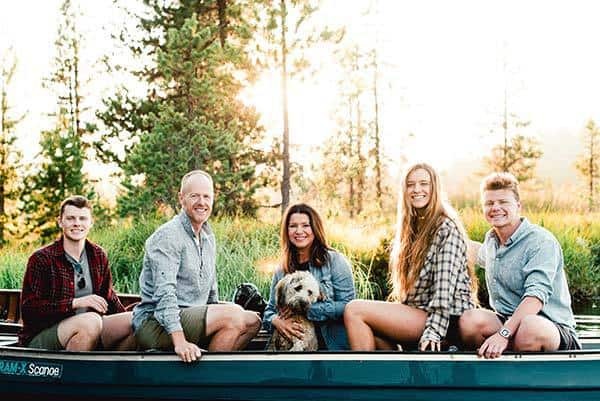 Full of little kids, who are like or own kids (or grandkids), and we can’t wait to see them. I’m sure we’ll be pulling out the tub of legos and bins of American Girl dolls. When’s the last time you were invited to a dinner party? Bring an appetizer and wine! I love those words, especially when I have something so simple in mind. 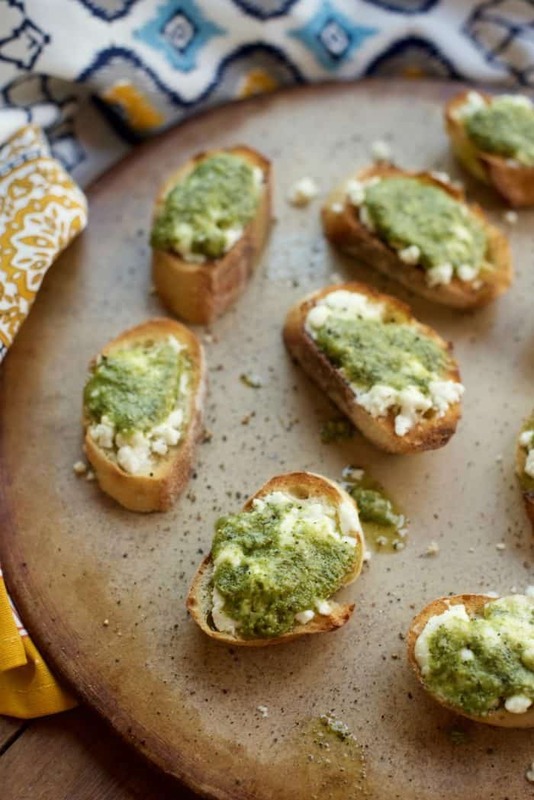 Like this Last-Minute Pesto Tartine Appetizer Recipe! Tartine: A French word that means open-face sandwich. Basil season can’t come soon enough, but in the meantime, I use store-bought pesto. We keep it on hand from Costco, or in the pantry (DeLallo brand). It’s safe to never run out of pesto! HA! Slice the baguette bread into 1/2-inch slices. Optional to toast (under broil HI for 1 minute). 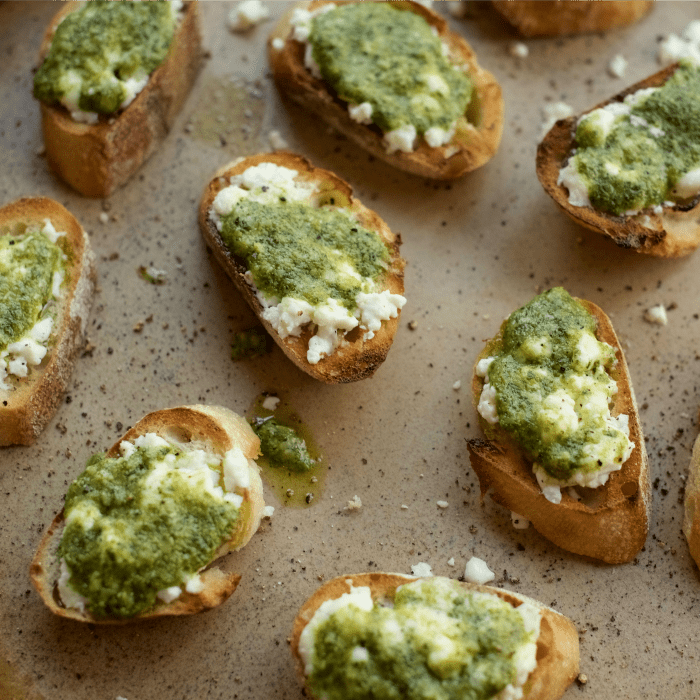 Spread the softened goat cheese on baguette slices. 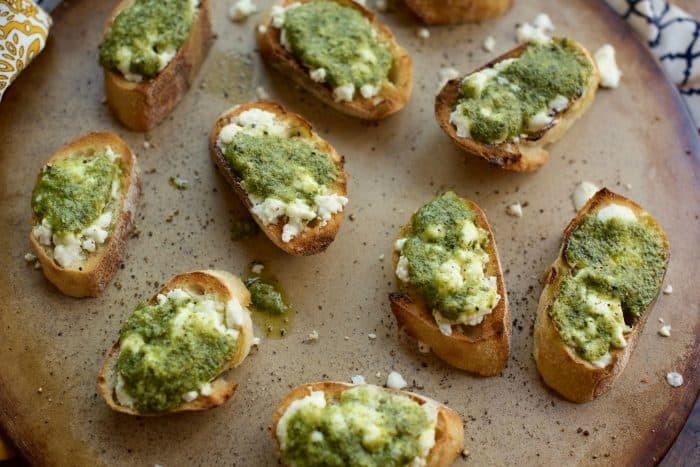 Top and spread each piece with a 1 tablespoon of pesto. Optional to broil again for 30 seconds to 1 minute, until bubbly on top. 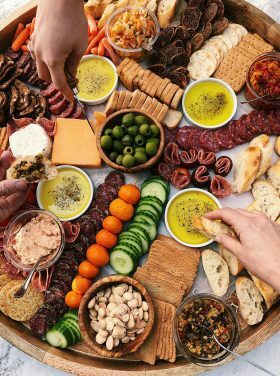 Hosting Game Day? Italian Pesto Sliders [Wine and Glue], Turkey Pesto Onion Cheese Sliders — so good! 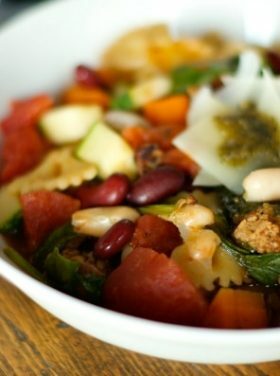 [RE], Easy Homemade Pesto Pasta Recipe [FoodieCrush], and Pesto Chicken Tortellini Soup [The Cookie Rookie]. Are you toasting the baguette? Your garden and yard in Medford was absolutely beautiful! I enjoy making homemade basil as it’s so easy and freezes well. Enjoy reading your “blogs” this one is a great one it’s so easy to get caught up in “turmoil” with people I wish I had your ease in meeting “new” people we use to entertain often years ago but as you know friendships dwindle away. Yes they can. Seasons of life, friendships come and go. I look at them as a “gift for today,” but honestly, we have so many that have stood the test of time. But we don’t just rely on those, we are always grafting new people into our lives! Thanks for sharing Kathleen! It is a mint plant. Yum! 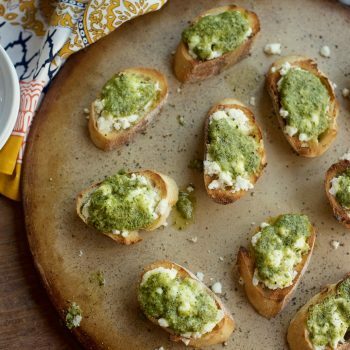 I love pesto and this sounds yummy! i think it would be good with bread that has been toasted too. 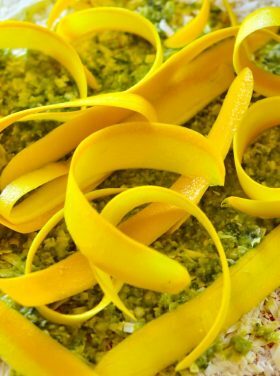 I have never made homemade pesto, but would like to try it since I”ve seen so many recipes for it. Sandy, what variety of basil is that? It looks serrated, like a mint. Gorgeous! 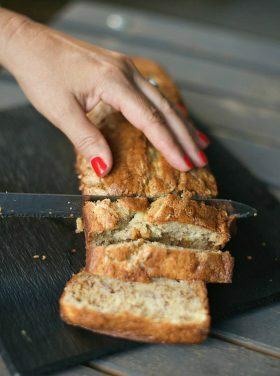 Can’t wait to have my first harvest to make this recipe. Thank you! Oh Sandy! I so agree with you about basil. I just love it…and yes, I could take a bath in it too! LOL!!! We have a farm nearby that grows beautiful flowers for cutting. I think they only charge something like $3.00 for a big bunch you cut yourself. Well…last year, they had basil growing too!…and my son and I cut so much and then rushed home and made pesto. It was luscious. But I agree that the store bought brands that are sold today are great too. I recently found one at the supermarket that was our store’s house brand (HEB, here in Texas) that was made with extra virgin olive oil – not some less expensive oil! And even better – it was reasonably priced. I’ve only made pesto once since it’s not a big hit with our kids but I’m definitely growing basil this year. We grilled some garlic basil burgers a couple of summers ago and my husband still talks about how great they were. 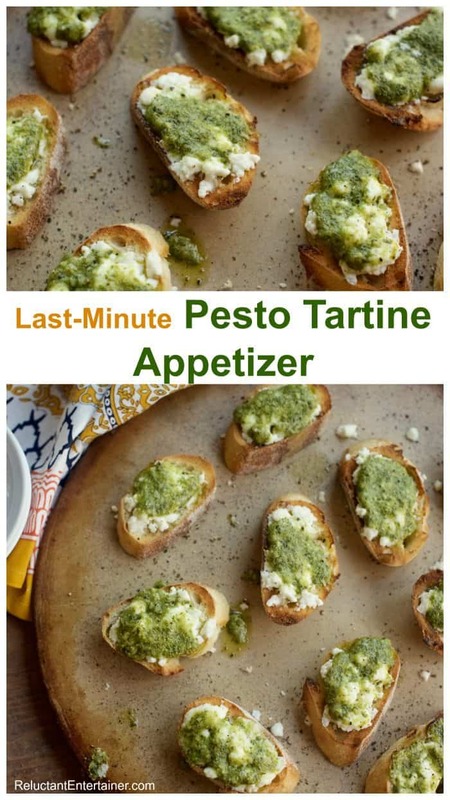 I’m going to give pesto another try too so I can try your appetizer. It looks great! We’re anxiously awaiting planting season for the tender herbs – basil being at the top of my list. I’m also going to make some herb boxes out of some reclaimed wood I got from my daughter. Cant’ wait to share it with you later in the season. For now, I’m content to watch the spinach and mesclum lettuce seeds sprouting. That basil looks so so pretty Sandy! I can’t get enough basil in the summertime. I love this appetizer! !